‘Twas the night before Halloween and the last day of Whole30(-ish)! And the people rejoiced! Actually, my current mood is pretty frazzled getting ready for the chili cook-off. I’m still looking forward to all of the excitement of tomorrow, but I would be even more enthusiastic if I didn’t have a sink full of dishes to wash, a to do list a mile long, and a suitcase I still need to pack for my pending vacation. And my house is a wreck too. So basically the typical state of things during the holiday season! I should just get used to my life being like this for the next two months. It’s certainly not a bad thing. I’ll gladly take a little disruption in my normal routine in exchange for experiencing my favorite time of the year. All I can do it try to enjoy the festive chaos to the fullest extent possible. 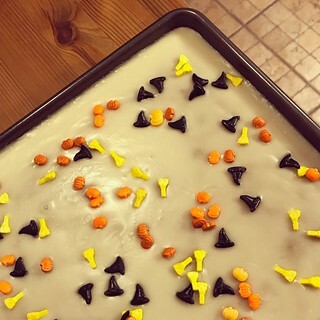 I celebrated both the arrival of Halloween and the departure of my month-long diet experiment by baking a pumpkin sheet cake when I got home from work (while watching the traditional October fare – “It’s the Great Pumpkin, Charlie Brown” and “Hocus Pocus”). I didn’t eat any of it because it’s for the chili cook-off, during which I will sample a wide array of desserts that have been off-limits to me for the last 30 days. For most potluck scenarios I would make an always crowd-pleasing chocolate sheet cake, but Halloween requires something more specialized. I know pumpkin spice has fallen out of favor recently, but it’s still a surefire winner when it comes to baked goods. I’ve made this pumpkin sheet cake before, specifically for the chili cook-off back in 2013, but that recipe included cream cheese frosting. This time I topped the cake with a white glaze (the frosting portion of my white Texas sheet cake) because I wouldn’t have to refrigerate the whole thing that way. Finding space in the fridge for such a huge pan would have been challenging. I also added some Halloween sprinkles (pumpkins and witch’s hats and brooms) for good measure. I’m sure it will be delicious, like so many other things at the chili cook-off. I’ll have a full report tomorrow. I have so much more to say, but it’s extremely late and I need to go to sleep ASAP. I hope everyone has a lovely Halloween!